The official Army boots for the Israeli Army, Air force and Navy. The boots were designed and manufactured especially for the idf uniform, The rubber "Non Slip" sole has a very low amortization and is very flexible and light. 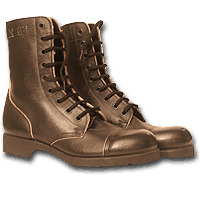 The boot is made out of fine leather and build to last long difficult missions and patrols in all situations.